Ice Island by Sherry Shahan. Review: Have you ever thought about what it would be like if you were on a frozen island, and you only had some dogs, a few supplies, and your brain to stay alive? Now, imagine doing this at the age of 13! This exhilarating experience is exactly what the main character does in the book Ice Island . Sherry Shahan has written a thrilling novel that will definitely keep you on your toes the entire time. This book is not part of a series. The main character in the novel is 13 year old Tatum. Here we have Tatum, an Alaskan teenager that is visiting an island called "Santa Ysabel". This remote, frozen island is completely covered in solid ice-hence the title Ice Island . Here on this island she meets a Siberian Yupik boy named Cole. They both share the dream of racing in the Iditarod, an intense competition in which the participants race across the majority of Alaska on dog sleds. One morning Tatum and Cole head out on a run just for some fun with two dog teams. Then disaster begins to strike. A crazy blizzard hits and the two find themselves stranded in the middle of nowhere. Now they must rely on their training to get them through this. The Alaskan wilderness is not the ideal place to be trapped! With no roads, houses, or people for several miles, they must use their quick thinking to find help while dealing with unhealthy huskies, subzero temperatures, crazy exhaustion, and a very low food supply. Help is a long distance away; will Tatum and Cole make it? Overall, this was an impressively written novel. There were many positive things about the book. A good thing is how incredibly vivid the imagery is. The author makes everything that happens immediately appear in your head as if you were there. I think one reason for this great detail on the character's thoughts and feelings are the author's personal experiences. Sherry Shahan has actually been to Alaska several times, and has even participated in the Iditarod. She knows how the characters might feel and what they would do because of personal experiences. It takes a lot of creativity to write a book like this. Any story that is about the Alaskan wilderness has to be very creative, because few people are experts on this. The one thing that some people might feel challenging is some of the terminology used. The two dog mushers infrequently use terms to trigger the dogs' actions. Also, one of the characters is a Yupik, so there are some Yupik terms like "quyana" (the Yupik word for 'thank you') used. There is a glossary in the back of the book which explains what these words mean, so this was not a problem for me. This may concern some people since you have to flip back and forth to get the definition. I would recommend this book to middle school and high school students because they would relate to this book the most. This book would still be a great read for anybody that is interested. All in all, this book is an amazing read. I enjoyed it tremendously. I have never rated a book a 10 before, but this book is one of the best books I have ever read. I rate it a perfect 10 out of 10! We would like to thank Random House for providing a copy of Ice Island for this review. 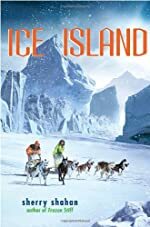 Have you read Ice Island? How would you rate it?